How good can Blender be for photorealistic food visualizaiton? What's the advantage of using 3D renders for food advertisement? Does it worth it effort? 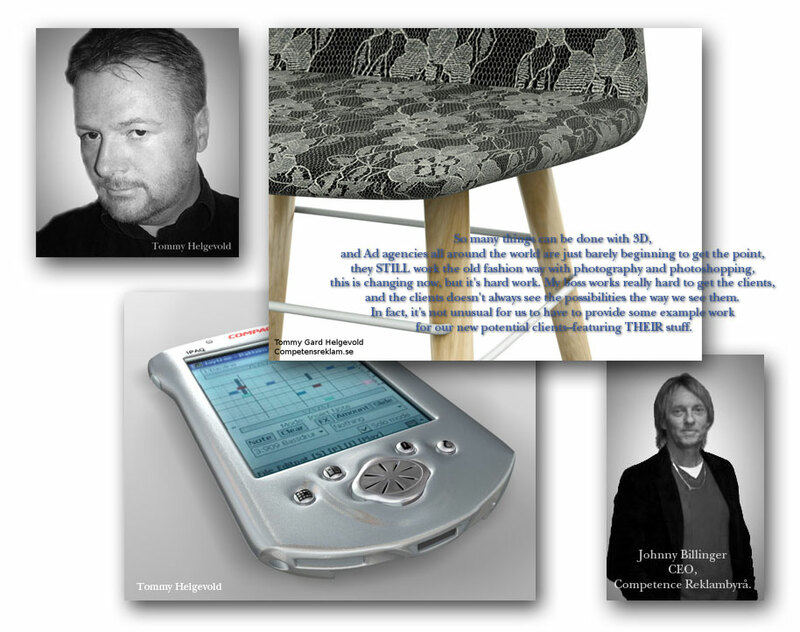 Here's an interesting observation made by Tommy Helgevold. Blender & Food - the Possibility published last week here on www.BlenderNews.org.-Editor in Chief. The company I work for (crbyra.se) is a small ad agency. We do everything from catalogs, local magazines to film and 3D product visualizations. Even though we have a full 3D studio Max 2013 suite with Mental Ray and Vray Advanced, we feel that Blender is an important part of the diversity of possibilities. Personally I've been using (and compiling the latest breed of Blender software) for years, all the way since NaN and where Blender had to be bought to unlock it for web publishing work, and was bought free later on to become the awesome alternative to the expensive commercial packages it is now. Open source is important because it pushes the limits of what can be done, rather than producing something meant for sale only. It makes it possible for many people to participate and innovate without corporate boundaries and limitations, this of course means that there may not be much money to be made to start with, but the experience and speed of development is unheard of, and very often lead to real work as there are many talents working with and for the development of Blender. At home, Blender is my personal choice, I don't even bring the cumbersome 3D studio max license transfer with me home, as I'd need the Vray license dongle and transfer the license for 3D studio max all the time, that is just bothersome and restricting, with Blender I can work anywhere under any OS. At work we have mostly MACs but I work on a fairly powerful PC with 2 large touch screens. I feel that the "hands-on" approach for sculpting and painting is the way of the future even if I am one of those veterans that origins from the good old DOS days (or in my case - Commodore 64 / Amiga days). At work we use Blender when it's important to get a fairly good result really fast. I know of NO software on this planet that can be used to get a finished result as fast as Blender. I've been using 3D studio max for MANY years, all the way since v1.2 to 2013, but NOTHING beats the workflow of the Blender interface and system, it's modelling tools are just that much more practical and well though out. I've won quite a bit of speed-modelling contests because of this little (still unknown fact, to most professionals). Most professionals just want to get the job done, but a lot of them doesn't really believe in free (open source) software alternatives, maybe that will change one day, but until then - we at the company really enjoy this little "secret." We had this client that came to our office one day, and I overheard one of my colleagues having a discussion with him about the photographed hot dog that came from one of our professional photographers, something about the hot dog looking too sloppy ... too ... dry ... too old, and the ketchup just didn't come out right, and it wasn't even delicious looking as it didn't have any grill marks, etc ... .
...Then I suggested that we could to it in 3D, the client rolled his eyes and shook his head at this, 3D food? Yeah right. 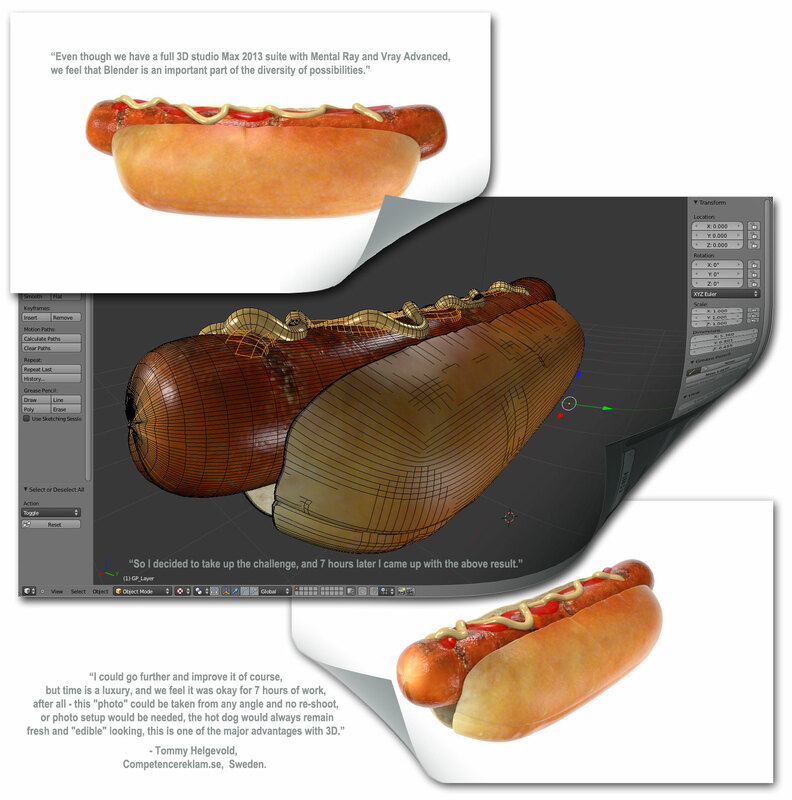 And he's right of course, it's VERY difficult to make convincing food in 3D, just do a search on google on 3D hot dog and see how many realistic 3D images of hot dogs you can find, I bet this will change since some of us made the first step but for now, you can see for yourself. So I decided to take up the challenge, and 7 hours later I came up with the above result. I could go further and improve it of course, but time is a luxury, and we feel it was okay for 7 hours of work, after all - this "photo" could be taken from any angle and no re-shoot, or photo setup would be needed, the hot dog would always remain fresh and "edible" looking, this is one of the major advantages with 3D ..., if you do it right. Don't kid yourself though, I've got 18 years experience in the 3D industry, it takes practice, and there is an old saying that still goes - everything can be improved, I'm nowhere NEAR as skilled as many of the artists you'll eg. find on Cgtalk.com (just take a look at their 3D choice gallery, and you'll get the picture). But it goes to show that there is a niche for everyone out there. Just because you're not the hottest thing in 3D pixar style, doesn't mean you can't make a living out of it, I've done that for years, and I'm still not "pixar material," but I am a professional, I make a living of what I do, and so are many of you out there. So many things can be done with 3D, and Ad agencies all around the world are just barely beginning to get the point, they STILL work the old fashion way with photography and photoshopping, this is changing now, but it's hard work. My boss works really hard to get the clients, and the clients doesn't always see the possibilities the way we see them. In fact, it's not unusual for us to have to provide some example work for our new potential clients--featuring THEIR stuff--just because without 3D modelling experience, the clients are unable to understand that modelling is just modelling no matter what you're making. If you can model a human, I can pretty much promise you that you'll be capable of modelling a camera. The other way around, however, is not so easy. But it's coming, people are becoming more and more aware of this, and we're getting more and more customers, we even made an entire smoke house (for smoking sausages!) with the entire factory process animated just to help a client of ours, tell HIS customers how this infernal super machine (the size of a small house) actually works, and he sold more machines that he expected on this. This is how VALUABLE 3D illustrations are!